With the peak of the Atlantic basin hurricane season (September 10) just 46 days away, I thought I’d provide a bit more context around what to expect in terms of tropical activity as we head into this part of the season. In the last seasonal update I provided on May 31, I highlighted several climate forcers that would likely drive this year’s activity and discussed possible track locations. So far, the general thinking has been accurate, and the recent activity can be used to expand on what the future might hold. Believe it or not, despite the majority of forecasts calling for below normal activity for the 2018 season, the Atlantic basin activity is running above normal in terms of Accumulated Cyclone Energy (ACE). Year to date ACE is 221% of what would normally be expected by this time in the Atlantic Hurricane Season, and all of this is from only two named storms (Beryl and Chris). Alberto was classified as a subtropical storm and did not contribute any ACE. Typically, the third named storm of the season forms by July 22, and Chris formed off the southeastern coast on July 6 of this year. The fourth named storm typically forms by August 8, and based on the long range forecast, there is a chance the season could fall back to below normal levels over the next two weeks. You might have noticed that tropical activity in the Atlantic and East Pacific basins has gone eerily quiet, while the West Pacific basin had five active systems at the start of this week. This is primarily a function of large scale conditions that suppress convection from the current phase of the Madden Julian Oscillation (MJO) and/or a convectively coupled Kelvin wave, which tends to drive interseasonal named storm activity across the northern hemisphere. The nearly off the charts MJO is currently in between Phases 7 and 8, which would provide positive upward motion over the West Pacific basin making it easier for tropical convection to develop, hence the recent active systems over the West Pacific basin at this time. As the MJO and a convectively coupled Kelvin wave move across the tropics, one should expect an increase in activity next week in the East Pacific basin as there are currently two areas being watched by the National Hurricane Center. Near the second week of August, the positive large scale upward motion should be positioned more over the Atlantic basin and will provide the next best chance for tropical development to occur. In the meantime, no tropical development is forecasted for the Atlantic basin due to several climate forcers limiting named storm development at this time. Below, I provide an update to the major climate forcers outlined in the May 31 update. Although the recent African dust outbreaks are right in line with climatology, they have been pronounced, and in some instances have been immersing the Gulf Coast states with African Saharan dust. These masses of dry, dusty air that form over the Sahara and move over the tropical North Atlantic every 3-5 days are often 1-3 miles thick. As these dusty dry Saharan air masses move across the tropics, they can have significant impacts on tropical cyclones because the dry and intense air deprives the storm of moisture, and its winds interfere with a storm’s convection. The dust can also limit sunlight, which creates a more stable air mass. This image from the Cooperative Institute for Meteorological Satellite Studies / University of Wisconsin-Madison is useful for monitoring the position and movement of dry air masses such as the Saharan Air Layer (SAL) and mid-latitude dry air. One possible reason for the large amount of African dust could be due to a stronger African Easterly Jet which pushes the dust to the Americas. This stronger wind also creates wind shear (created when some horizontal winds are faster than others). This will limit the ability of clouds to grow vertically, which is needed for named storm development. Over the past month, vertical wind shear has been above average across the Caribbean and near average across the tropical Atlantic Main Development Region (MDR). According to Colorado State University’s seasonal forecasts, July vertical wind shear in the Caribbean has historically had a stronger correlation with Atlantic hurricane activity than vertical wind shear over the Atlantic MDR. This image is from the Cooperative Institute for Meteorological Satellite Studies / University of Wisconsin-Madison. The presence of wind shear (Areas of Red and Yellow) is hindering named storm development. A low shear environment (Green Areas) is favorable for tropical cyclone development. Wind shear values below 20 kts are considered low enough for tropical cyclogenesis. The latest ENSO 3.4 region Sea Surface Temperatures (SST) anomaly is 0.4C, which is within the neutral ENSO range, but right on the edge of an El Niño classification of 0.5C. The atmosphere appears to already be responding to El Niño type conditions, which could be why the vertical wind shear has been above average across the Caribbean. The various climate model ensemble average calls for borderline weak El Niño conditions for the peak of Atlantic hurricane season (August-October), with the potential for weak to moderate El Niño during the winter months of 2018/2019. If these conditions develop as predicted, they would likely further hamper tropical development over the MDR and Caribbean Sea. However, El Niño historically does not have any influence on storms that form near the U.S coastline or in the Gulf of Mexico, where the bigger concern for this season is based on the SST. The Atlantic SST has a negative Atlantic Multidecadal Oscillation (AMO), which the insurance industry has traditionally associated with a lower landfall rate. What is even more amazing is that given the calendar has almost reached August, the zone that can support named storm development (water greater than 26C) over the MDR doesn’t start until 50 degrees West in longitude. And what is even more amazing is the water is warmer in the North Atlantic versus the water temperature in the MDR. When we connect this with what has already occurred this season, Tropical Depression 2 (Beryl) first came to life after it passed 40 degrees West in longitude at 41.4 degrees West. It quickly became a hurricane before it weakened due to high wind shear over the Caribbean Sea and dry dusty air that got entrained into the system as Beryl strengthened. But yet, Beryl came back to life over the much warmer waters off the East Coast of the U.S. This is exactly the same area where Chris formed into a Category 2 hurricane. This area off the East Coast should be watched closely as the SST are more conducive for tropical development versus the MDR SST. Both Hurricanes Beryl and Chris gave us some insight into what to expect this hurricane season. Chris formed over the warm waters off the North Carolina coastline. Beryl was originally a small named storm developing from an African wave, and even though it weakened over the Eastern Caribbean, its energy mass ended up recurving off the East Coast before redeveloping into a subtropical storm 290 miles north of Bermuda. It is this general flow that needs to be watched given the position of the Bermuda high, which could steer named storm activity near the East Coast as the Bermuda high pressure fluctuates in intensity and position. Therefore, the East Coast of the U.S. has the highest named storm landfall threat as we approach the peak of the season, even though many of the climate forcers suggest below normal activity overall. 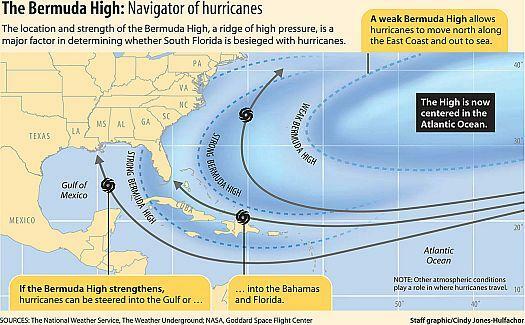 This image outlines the possible flow of named storm tracks as we move into the peak of the Atlantic Hurricane Season. Another area of concern that should be watched for late season named storm development is the Gulf of Mexico. The SST plot above shows very warm waters over this region, which is a result of the record heat that has been experienced in Texas over the last several weeks. Keep an eye on this area as we get into the later part of the Atlantic hurricane season.